The right Buildings help you recruit Adventurers, who provide even more Victory Points and special powers. Keep an eye on your fellow players as they will be trying to build a grander village and may even attract the Adventurer you were hoping to recruit. 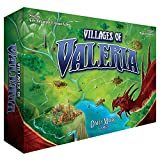 The player with the most Victory Points at the end wins the game, and their village will become the Capital City of Valeria! 1 Give each player a Castle card and a Player Aid card. Return unused Castle and Player Ad cards to the box; they will not be used. Each player places their Castle card face-up in front of them on the table as the first card in their Village (tableau). 2 Select the starting player in any way you wish, perhaps the person who last built something. Give that player the Active Player Token and the Action Selection Card. 3 The number of Gold coins used in the game depends on the number of players. Form the bank by taking the number of Gold coins shown in the table below. Place any remaining coins back in the box; they will not be used. Then give each player 3 Gold coins from the bank. 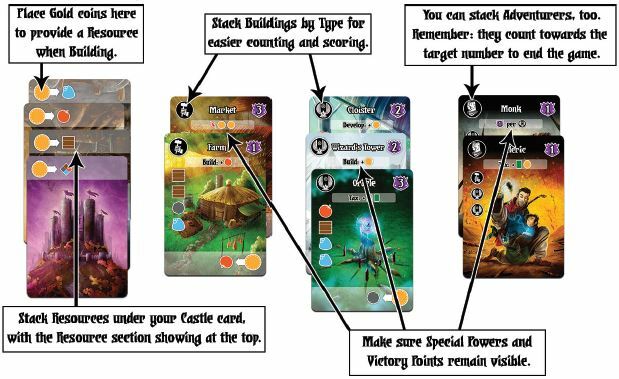 4 Separate the remaining cards into two decks: Adventurers and Buildings. Shuffle each deck separately. 5 Deal 6 cards from the Buildings deck to each player. These cards form the players' opening hands, which they keep secret. 6 Deal a row of 5 face-up Building cards in the center of the table; these are your Building piles. Place the rest of the Building cards face-down next to the Building piles. This will be the Buildings draw deck. 7 Deal a row of 5 face-up Adventurer cards in the center of the table (above the Building piles); this is your Adventurer pool. Place the rest of the Adventurer cards face-down next to the Adventurer pool. This will be the Adventurers draw deck. 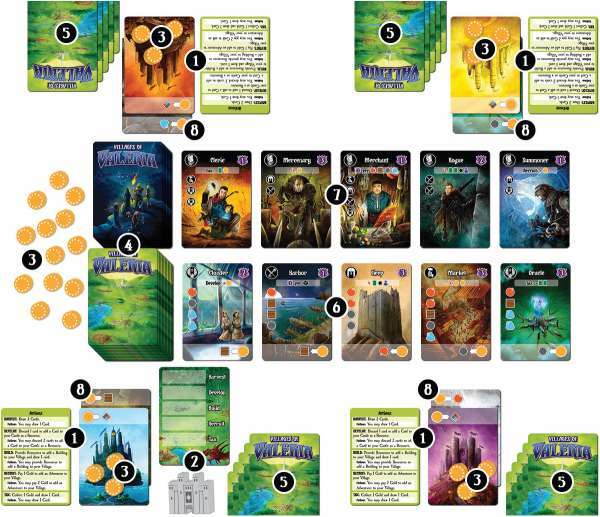 8 In turn order (starting with the active player and going clockwise), each player selects 1 Building card from their opening hand to Develop as a Resource, at no cost. This special round of developing happens only once, at the start of the game. Note: slide the selected card face-up and upside-down under your Castle card. 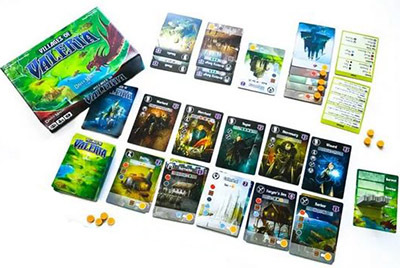 Thus, each player will have one Wild Resource (provided by their Castle) and one ordinary Resource of their choice available on their first normal turn. Now begin taking normal turns starting with the active player and going clockwise. There are two kinds of cards: Building cards and Adventurer cards. Each Building card has two sections: the Resource section (at the bottom of the card) and the Building section (the rest of the card). 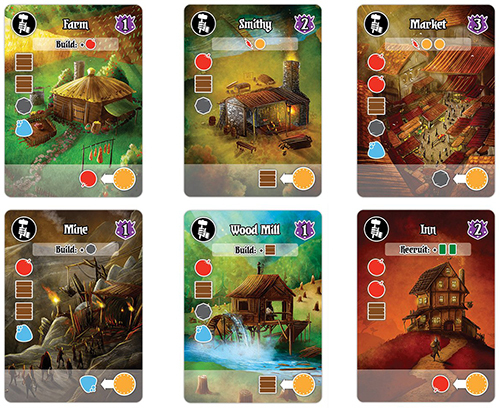 Each Building card has a type, shown by a Building Type icon (Worker, Soldier, Shadow, or Holy) in the upper-left corner. Adventurer cards are similar to Buildings, but do not have a Resource section. Each Adventurer card shows the Adventurer icon in the upper-left corner. There are four Resource types: Food, Wood, Stone, and Magic. The Wild Resource provides the player with any one of the four types of Resources. When you develop a Building card as a Resource, place it in your Village face-up but upside-down, so that the Resource section is at the top, and slide it under the top of your Castle card. As you develop more Resources, keep placing them under your Castle in an upward stack, with only the Resource section showing. (Note: The rest of the card no longer matters once a card has been developed as a Resource). To develop a Resource, either lead the Develop action on your turn or follow that action on another player's turn. 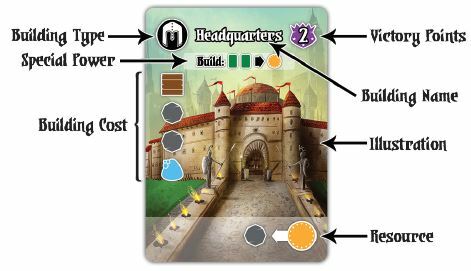 When you build a card as a Building, place it face-up in your Village, to the right of your Castle. The Building's name, Victory Points, and special power (if any) should be visible at the top of the card. We recommend that you group your Buildings by type for easy counting and scoring. Note: The Building Cost and Resource Type no longer apply to a built Building; they should be J ignored, and it is okay to cover them up. Buildings provide Victory Points, which are scored at the end of the game. Most Buildings provide special powers for you to use immediately (if it has ), or in later turns. To build a Building, either lead the Build action on your turn or follow that action on another player's turn. Important: You may not have more than one Building with the same name in your Village. Adventurer cards cannot be developed as Resources (they have no Resource section at the bottom). Adventurers can give you valuable special powers, and they can be worth more Victory Points than the average Building. 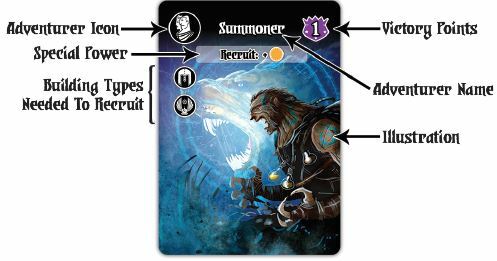 To recruit an Adventurer, either lead the Recruit action on your turn, or follow that action on another player's turn. We recommend that you group your Adventurers together for easy counting and scoring. When you discard a card, place it face-up on any of the Building piles. If you discard more than one card, you may choose the same or a different pile for each card. Whenever you draw a card, you may choose to draw the top card of any Building pile, or draw the top card of the Building deck. (You may not draw Adventurer cards into your hand; you must Recruit them). If you draw more than one card, draw them one at a time. You may choose to draw each card from the same or a different pile. If you draw the last card from any of the Building piles, immediately replace it by drawing the top card from the Building draw deck, and placing it face-up in that pile. Each Building pile should always have at least one card in it. You may have at most 8 cards in hand after leading or following an action. You may draw cards without worrying about your hand limit. After completing your action, discard if necessary until you have 8 cards in your hand. You may choose any cards in your hand to discard when doing this. Example: Helen has 7 cards in her hand, and the Guard Tower in her Village. She follows Rick's Harvest action to draw 1 card, then 1 card for the Guard Towers power, giving her 9 cards. She then discards 1 card at the end of her action. If a special power allows you to steal cards from an opponent, treat it the same as drawing: take as many cards as you are allowed to steal, then discard down to the limit at the end of your action. During earlier turns, Gold coins may have been placed on your Resource cards, either by you or by other players. At the start of your turn, remove all Gold coins from your Castle and Resource cards. Keep the coins; they are yours. Choose one action by placing the Active Player Token on the Action Selection Card and take the action. This is called leading the action. After you have taken your action, each other player may optionally follow your action, in clockwise order starting with the player to your left. When all other players have either followed your action or declined to do so, your turn is complete. Pass the Active Player Token and Action Selection Card to the player to your left. There are five actions in the game: Harvest, Develop, Build, Recruit, and Tax. Important: If the action has a cost (for example, the Develop action requires you to discard one or two cards) then the cost must be paid at the start of the action. If you cannot pay the cost, you cannot lead or follow the action. Lead: Draw 3 Building cards into your hand, one at a time. Follow: Draw 1 Building card into your hand. Lead: Discard 1 card from your hand to add one other card from your hand to your Village as a Resource. Follow: Discard 2 cards from your hand to add one other card from your hand to your Village as a Resource. Lead: Pay the cost of one Building card from your hand to add it to your Village as a Building. Then draw one card into your hand. Follow: Pay the cost of one Building card from your hand to add it to your Village as a Building. Do not draw a card. Important: You may not add duplicate Buildings to your Village. Building Cost: In order to add a Building to your Village you must be able to pay its Building Cost. Each Building costs one or more Resources. You must provide each Resource by placing one of your Gold coins on a matching Resource card, and/or by using Resource powers. (Note: We recommend you place your Gold coin on the Gold icon rather than on the Resource icon. Seeing what Resources you have developed at all times will help you plan for future actions). You may place Gold coins on your own and other players' Resources. (Note: Gold placed on other players' Resources will belong to those players when it is their turn to lead an action). Example: Helen wants to build the Armory, which costs to build. She places 3 Gold coins: 1 on her Castle which gives her a Wild Resource of her choice (she'll choose a Stone Resource) and 1 on her Wood Resource. She still needs another Stone Resource but does not have one developed. She places 1 Gold on Rick's Stone Resource to provide the final Stone she needs to build the Armory. You may not spend a Gold coin that is already on a Resource card. You may not place a Gold coin on any Resource that already has a Gold coin on it. Castles and Wild Resources: Your Castle provides you with one Wild Resource. You may spend a Wild Resource as if it were any other kind of Resource: Food, Wood, Stone, or Magic. Important: Although you may spend your Gold to use other players' developed Resources, you may not spend your Gold to use the Wild Resources on other players' Castles. You may only use your own Castle's Wild Resource. Lead: Pay 1 Gold coin to the bank to add an Adventurer to your Village. Follow: Pay 2 Gold coins to the bank to add an Adventurer to your Village. Recruitment Requirements: Adventurers will only come to your Village if they feel comfortable there. Each Adventurer shows a requirement of one or more Building Types. Your Village must have Buildings matching those types, or you may not recruit the Adventurer. To add an Adventurer, choose any one face-up Adventurer card from the Adventurer pool and place it face-up in your Village. Then draw the top card from the Adventurer deck, turn it face-up, and add it to the pool to replace the one taken. (If no cards are left in the Adventurer deck, skip the replacement step). Example: Tom wants to recruit the Paladin, which requires him to have a and a Building in his Village. He has one of each, meeting the requirements. He leads the Recruit action and pays one Gold coin to the bank, takes the Paladin, and adds it to his Village. Lead: Take 1 Gold coin from the bank and draw 1 Building card into your hand. The number of Gold coins in the game is limited. If there are no more Gold coins in the bank, do not take a Gold coin. You may still lead or follow the Tax action, even if there is no Gold left in the bank; just draw 1 Building card into your hand. Some powers are marked as instant with the icon. These powers are used one time in (and only in) the same action that the Building or Adventurer granting the power is built or recruited. Building or Adventurer granting the power is built or recruited, but they can be used in any later actions. These powers can be used once per action. Example: Rick leads the Build action and builds the Wizard's Tower, which has the Build: + power. He doesn't collect the Gold on this action, but may use this power during a later Build action, whether he is leading or following. Powers are optional. You may always choose not to use a power. Powers are cumulative. Example: Tom has the Cathedral, which has the Tax: + power, and the Oracle, which has the Tax: + power. Tom leads the Tax action on his turn, which allows him to use his powers to draw a total of 3 Building cards and to take 2 Gold coins from the bank. Helen has the same 2 Buildings in her Village. She follows Tom's Tax action, draws 3 Building cards, and takes 1 Gold. Most special powers have no cost. If they do have a cost (e.g. discarding one or more cards) you must pay the cost at the time you use the power. If you cannot pay the cost, you cannot use the power. Any power that grants with or without a cost, is called a Resource power. These resources may be applied when leading or following the Build action, to pay part or all of the building cost. You do not need to place a Gold coin on the card to use the power. You may only use each Resource power one time during an action. Example: Helen has the Farm, which has the Resource power Build: + in her Village. She wants to build the Tannery, which costs . Following a Build action, Helen uses her Farm to provide the Food resource she needs to build the Tannery, then adds it to her Village. All other special powers, including instant powers, cannot be used until after you have completed the basic action. Example: Rick has the Barracks, which has the power Develop: + . Unfortunately, Rick does not have enough cards in his hand to pay for the Develop action; he may not use the Barracks to gain a card until he has paid for and completed the Develop action using cards already in his hand. If you have multiple powers that apply to your action, you may resolve them in any order. Example: Helen builds the Witch's Hut, which has the power (immediately discard one card to gain one Gold coin). It was the only card in her hand, but her Village already has the Armory, whose power is Build: + . After paying the cost of building and adding the Witch's Hut to her Village, she first uses the Armory to add a card to her hand and then uses the Witch's Hut to pay that same card to gain a Gold coin. 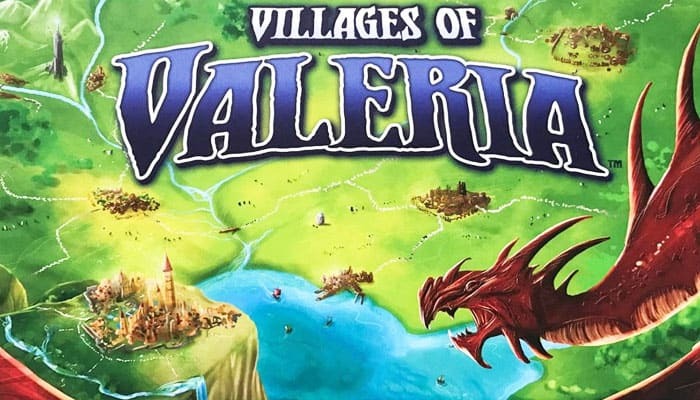 The game ends after a turn in which any player's Village contains a certain number of Buildings and/or Adventurers, as shown in the table below. This can happen either because the active player has built a Building or recruited an Adventurer, or because another player following the action has done so. The entire turn is played out, so even if the active player triggers the end of the game, all other players still get a chance to follow the action and add to their own Villages. Note: Developed Resources and the Castle do not count toward the total. Add up the Victory Points shown in the upper-right corner of each Building and Adventurer in your Village. Resources and cards in hand do not count. Then add Victory Points granted by any special powers that your Buildings and/or Adventurers might have. (For example, the Knight grants an additional Victory Point for each Building in your Village). Finally, add one Victory Point for each Gold coin in your possession (including those on your Resource cards and Castle). In the event of a tie, the tied player with the most Buildings and Adventurers wins. If there is still a tie, the tied player with the most Gold coins wins. If there is still a tie, the tied player with the most developed Resources wins. Still a tie? Okay, all tied players win.